Hiking the ridges to Red Hill. Sweat is running down my face because the trail is heading up. Rather steeply in fact. I pause, re-adjust the straps of my backpack for the umpteenth time and then trudge up the trail a bit further only to pause again. Anybody who says climbing a mountain with a backpack on is fun has either reached thin air or has confused backpacking with masochism. Traversing ridgelines with 30 pounds of equipment is as much fun as a pulled muscle at night or sore shoulders in the morning. What is fun is camping on knobs and open ridges where you can pitch a small tent (big ones are too heavy to carry) and spend a long evening watching the sun set over acres of forests, river valleys or entire lakes. The next morning brings another enjoyable moment – coffee at sunrise – and this time no climb is required. Wolf Mountain: This is a high camp for those with short legs. The trek to the top is less than a half mile from the trailhead. Located southeast of Wakefield in the Ottawa National Forest, the start of the trail is reached by turning north onto Forest Road 9300 from US-2. After crossing Little Presque River on FR-9300, you’ll see the mountain before reaching the trailhead at the end of the road. The hike is a stiff climb up – no pain, no gain right? – but within 15 minutes or so you’re on a rocky knob looking at a 180-degree panorama. The scenery is a rugged ridgeline to the west while to the south is an endless sea of pines that stretches into Wisconsin. It’s such a great sunset watching spot, some campers have made a rustic “lounge chair” out of logs to enjoy it. For a trail map click here. Gogebic Ridge: The Gogebic Ridge Trail is a 7.5-mile route that begins off Forest Road 250, just north of M-28, and ends at a junction with the North Country Trail. Along the way it climbs several highpoints, including Cookout Mountain. But that mountain top is too forested to offer a great view. A much better place to camp is a high rocky bluff reached 1.7 miles from the trailhead on FR 250. The climb up is steep but it last less than a quarter mile and you’re rewarded with a stunning view of Lake Gogebic from a spot that once was the site of a fire tower. Cuyahoga Peak: Located in Porcupine Mountains Wilderness State Park is the Escarpment, probably the most popular ridgeline in Michigan. 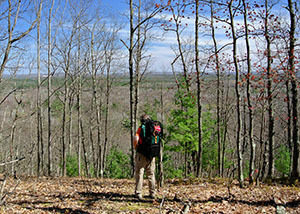 But what most hikers overlook is the backcountry campsite just off the trail that runs along it. From the trailhead at the end of M-107, the Escarpment Trail extends four miles east and within 2.5 miles reaches the high point of the trek, Cuyahoga Peak at 1,600 feet. Just east of the peak is a backcountry campsite with a fire ring and space for one or maybe two small tents. From your site you are within three steps of the edge of the rocky bluff where you can sit all night and watch the stars or possibly the Northern Lights reflect off of Lake of the Clouds. Red Hill: In the Lower Peninsula, there are a couple of high points where you can set up camp and enjoy a panorama from your tent. The best is Red Hill, located along the Manistee segment of the North Country Trail. The 10-mile trail extends north from High Bridge Road just off M-55 near Wellston to Hodenpyle Dam Pond Road two miles south of M-115 near Mesick. But the quickest way to reach the highpoint is from Coates Highway, 7 miles east of the hamlet of Brethren. On the north side of Coates Highway, the North Country Trail is marked — from there you hike north, reaching a junction posted “Red Hill Overlook” in 1.7 miles. From the junction, it’s a climb of a couple hundred yards before breaking on top of Red Hill, which at 1,105 feet provides a sweeping view of the Manistee River Valley. For a trail map click here. Peak 1,140: This high point along the Hoist Lakes Foot Travel Area west of Harrisville has no official name (how about Mount DuFresne?) but does have a nice view that requires a stiff climb. The peak is best accessed from the western trailhead reached from M-65 north of the town of Glennie by turning west on Sunny Lake Road. Within 5 miles, turn north on Au Sable Road and then at the first junction continue north on De Jarlais Road to reach the trailhead in a half mile. It’s a 2.4-mile hike to the peak along a trail that first passes Bryon Lake. In late fall peaks of the rugged Huron National Forest leading to the Au Sable River are possible. Information: For more information or a trail map to Gogebic Ridge or Wolf Mountain, contact the Ottawa National Forest Visitor Center (906-358-4724). For more information on Cuyahoga Peak, contact the Porcupine Mountains Wilderness State Park at (906-885-5275; www.michigan.gov/porkies). In the Lower Peninsula contact the Manistee Ranger District office of the Manistee National Forest (231-732-2211; www.fs.fed.us/r9/hmnf) for information on the North Country Trail or Red Hill and the Huron Shores District Ranger of the Huron National Forest at (989-362-8961; www.fs.fed.us/r9/hmnf) for information or a map for Hoist Lakes Foot Travel Area.